The following long paper was delivered at the Digital Humanities 2014 conference. It was co-authored by Alex Christie, Stephen Ross, Jentery Sayers, Katie Tanigawa, and the INKE-MVP Research Team. You can read the abstract here, and the slidedeck for the presentation is here. One of the most basic analytical tools we employ in literary criticism is to consider the setting of a literary work: where does the action take place? Naturally, if the action takes place in a city with the same name and some of the same recognizable features as cities existing in the world, we assume that the fiction is set in the real city. At the same time, no city in a novel is precisely the historical or actual city you could up and visit. We all know that cities in novels are fictitious. They are constructs sometimes used to illustrate characters’ states of mind, sometimes used to point out ideological or political interventions, sometimes used to invoke historical narratives. And yet the impulse persists to think the city of Paris is the same as the Paris in Djuna Barnes’s Nightwood, or Jean Rhys’s Quartet, or Ernest Hemingway’s A Moveable Feast, or F. Scott Fitzgerald’s Tender is the Night. This list could continue on. Most of the time, these two impulses—to identify the fictional city and the real city, and yet to disavow that identification—co-exist quite comfortably. We often behave as though the historical city and the city in fiction are the same, driven by the determination to discover the city in the novel, rather than the novel in the city. 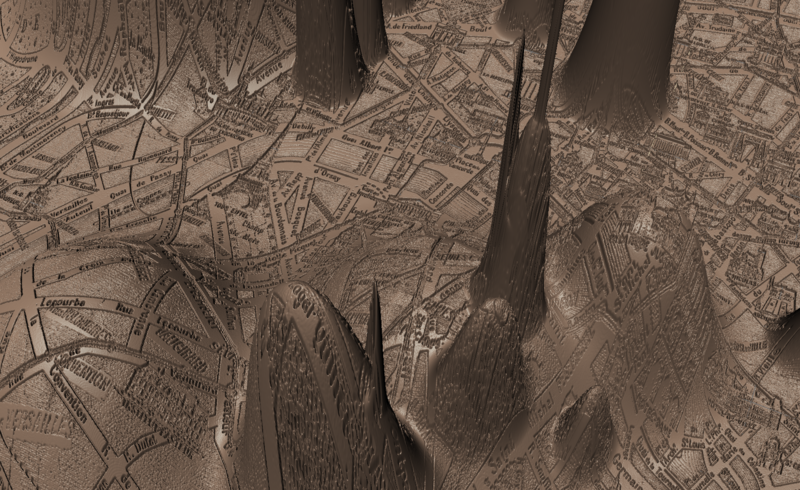 Against those approaches that try to map novels’ action onto actually existing cityscapes, our z-axis work privileges the cities in novels, giving primacy to the “warped” versions of reality that novels produce, and interpreting those warped cities on their own terms. Indeed, the history of mapping literary works has tended to two key trends with which our own work takes direct issue: realism and isomorphism. First, realism. Because most realism is verisimilar—especially in its depictions of the everyday—it depends upon creating the illusion that the world of the fiction is the same world people live in. This illusion enables the second problem: isomorphism. When many literary critics interpret cities in fiction, they almost uniformly treat the fictional cities as reproductions of historical cities. For all their emphasis on psychological interiority, fragmented subjectivity, subjective experience, and fluid realities, modernist critics have not fared much better. All too frequently they think of modernist experimentation as simply heightened realism, following the sort of isomorphic approach to mapping novels enabled by technologies such as Google Earth, which uses precise pins and accurate base maps to locate fictional events in actual cities. By contrast, many canonical modernist novels warp or transform historical cities to produce fictitious, highly biased, and subjective versions of them. Djuna Barnes situates the activity of lesbian characters in her novel Ryder in the Rue Jacob, which, as Amy Wells-Lynn documents, is not a street that actually exists in Paris. In Barnes’s other novel, Nightwood, Doctor Matthew O’Connor describes a carriage ride through the Bois de Boulogne as taking place somewhere near Pont Neuf. Elsewhere, Marya in Jean Rhys’s Quartet rapidly travels between cafes in multiple locations. To label these accounts of Paris inaccurate would be to overlook their deliberate transformations of its geography. Matthew O’Connor is nervous of the Bois do Boulogne because it makes him painfully aware of his class status; Marya jumps between multiple areas in Paris in an attempt to find a sense of place and belonging in a string of cafes and hotels. Rather than seeing people and objects as features situated within a city, many modernist writers provide partial, situated, and imaginary accounts of cities, themselves. As Debora Parsons writes in Street Walking the Metropolis, “The urban landscape needs to be studied as a feature that brings the psychological and material into collusion, in terms of theories and aesthetics that construct modern subjectivity and modern art from material urban experience. This is to interrelate the observed with the observer, and to assess how the identity of one affects the other.” Modernist literature confirms this phenomenon. For instance, the Parisian café life described through Marcel Proust’s Swann and Odette differs markedly from that of Rhys’s Marya or Barnes’s Robin Vote. These novels do not take place in the same Paris, but instead rewrite the city itself to produce distinct literary versions of Paris, or multiple Parises. Jon Hegglund confirms this practice, explaining that “writers meld their own city, leading to the simultaneous experiences of multiple cities (Parises in this case) as each writer constructs his or her own (and perhaps even multiple) geographic interpretations…” (80). Although critics may want to document the modernist dismantling of geographic isomorphism, the question of expressing these and other modernist cities remains: If existing geospatial approaches to modernism map the novel in the city by affixing literature to specific longitudinal and latitudinal points, then how might we instead go about mapping the city in the novel? To this end, the Implementing New Knowledge Environments (INKE) and Modernist Versions Project (MVP) teams have developed a methodology for producing maps of modernist cities, treating them as warped versions of the historical cities they appear to refer to most directly. In the spirit of the affective maps produced by the Situationists in the 1970s, not to mention recent work by Bethany Nowviskie, Johanna Drucker, and the Neatline Project, our z-axis research treats the cities in these novels as independent entities with mappable dimensions that only coincidentally correspond to geographical coordinates. The results are fascinating, and sometimes bizarre, and afford profoundly new ways of understanding the cities in these novels, and of thinking about the relationships between literature and space, literature and place, imaginary topographies, realism and modernism, verisimilitude and simulacrum. The novels in question are both set in a city called Paris that shares many characteristics with the city of Paris many of you have no doubt visited. Barnes’s Nightwood details the sexual and romantic activity of a group of queer characters living in and around Paris’s Latin quarter. Jean Rhys’s Quartet is the semi-autobiographical tale of Rhys’s own ill-fated love affair with Ford Madox Ford, and it follows the protagonist, Marya, and her descent into poverty after her husband, who lives off crime, is thrown into jail. Rhys’s narrative describes Marya’s fall into poverty and trauma through her experience of the city, while Barnes explores the relationship between class and queerness through the Parisian lives of her characters. 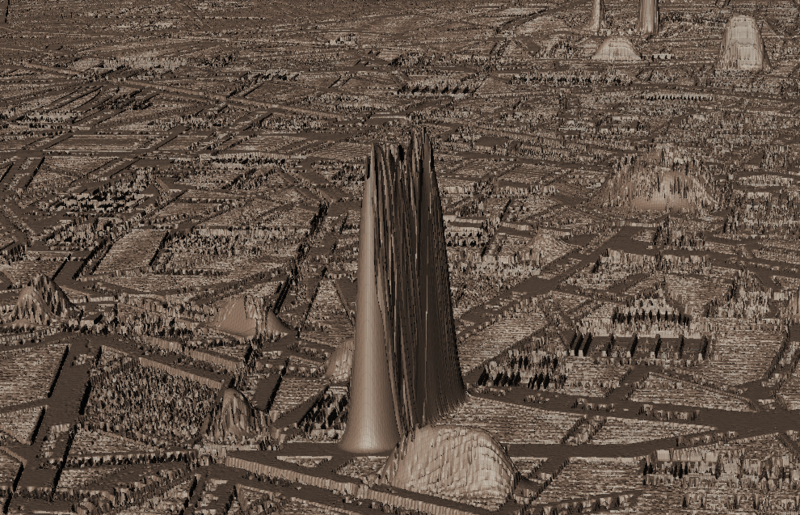 To express the way Barnes and Rhys transform Paris through these accounts, our z-axis method transforms historical maps from the modern period into 3D maps that are warped according to each section of the city described by each novel. Through methodological attention to cartographic display, a z-axis approach unpacks the social and cultural depth of archival maps that are otherwise read as only surface or image. The workflow for producing the maps involves, first, geo-referencing a modernist novel in TEI. In a vein similar to Markus and Best’s surface reading, we tag each location directly described by the narrative to document the amount of description given to each section of Paris. Our TEI follows the narrative of the novel, including imaginary spaces and fleeting references, rather than plumbing the depths of figurative language and the like. The TEI is then transformed using XSLT to calculate the relative word count for each area in the novel, divided against the entire word count for the novel to produce a significance ratio. In the coming year, we will also be investigating topic modeling as a method for producing z-axis data and for visualizing complex connections between multiple areas on the map. In addition to text-based geographic markup of modernist texts, we also marked up each location in Paris through TEI embedded in an SVG copy of the scanned archival map. This image-based markup indicates the pixel location for each area described in the novel on the archival map, producing geographic coordinates rooted in the material properties of the historical map. The suggestion for using pixel location came to us from the Humanities Computing and Media Centre (HCMC) and work on the Map of Early Modern London (MoEML) based there; we would like to particularly thank Martin Holmes for his suggestions of best practices for this project’s use of TEI. The second stage implements the ratio and pixel location from the data model to transform historical maps into 3D models. 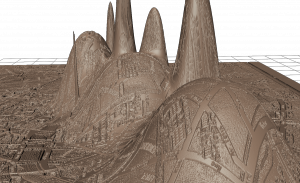 The transformation of the archival map into a three-dimensional model first requires scanning the original map and converting it into a displacement map. Displacement mapping is a computer graphics technique that uses difference in image contrast to displace the geometric position of points on a three-dimensional surface. 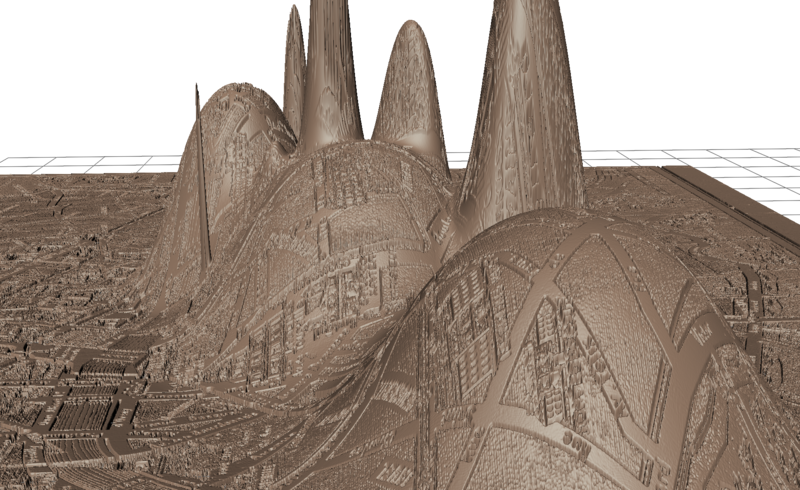 The displacement map is then applied to a highly subdivided plane mesh in the Autodesk Mudbox 3D modeling software environment to produce a three-dimensional mesh. This mesh is then warped using the grab function in Mudbox, with the significance ratio entered as the function’s strength value and the pixel location as the effect radius. The z-axis data expresses the relative amount of description given to each area of Paris, while the x- and y-axis data—the effect radius—expresses the specificity of the geographic reference. In the following year, we will also be investigating automatic transformation of the maps using Open GL as part of our work with Compute Canada. Applying this workflow to the historical map of Paris we used revealed important findings in relation to the novels under consideration. Specifically, we discovered that the archival map implements spatial warping and a two-and-a-half dimensional perspective to embed a capitalist logic into its cartographic expression. The Nouveau Paris Monumental map series was a famous tourist map of Paris used in the nineteenth and twentieth century as a pocketbook city guide. The z-axis map uses a map from the series made during the interwar period. 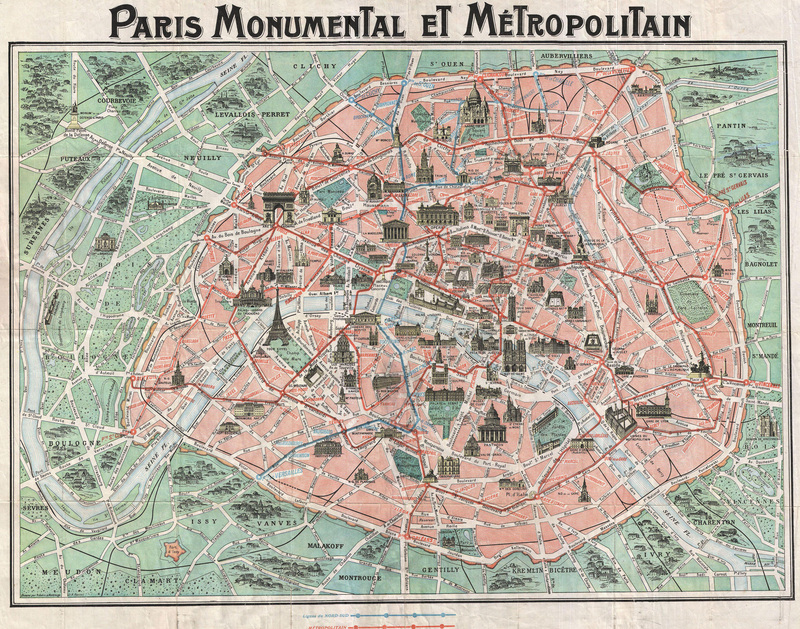 Implementing a 2.5 dimensional perspective, the map conflates angled views of Parisian monuments and underground views of the metro with street-level views of major Parisian boulevards. 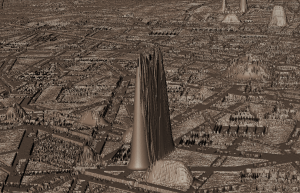 The vertical shrinking of Parisian space occurs in tandem with the horizontal warping of Paris, itself—areas surrounding key Parisian monuments appear larger on the map than they exist in Paris, whereas streets and areas that do not generate revenue are either shrunk or ignored altogether. Comparable to the novels we are studying, the map does not depict Paris as it actually existed at the time, but instead a partial and biased representation of a Monumental and Metropolitan Paris. For instance, the bulk of Barnes’s Nightwood takes place in streets just around Saint-Sulpice and south of the Boulevard Saint-Germain—an area that barely even exists on the Monumental Map. Barnes’s literary transformation of Paris conflicts with the cartographic warping seen in the map, corresponding with Anthony Vidler’s claim that modernist understandings of space coincide with warped and transformed methods of geographic expression. As Vidler suggests, “From the beginning of the century, the apparently fixed laws of perspective have been transformed, transgressed, and ignored in the search to represent the space of modern identity” (1). This modernist aesthetic was implemented methodologically as early as the 1930s, where surrealist practitioners invented a game called “embellishment of a city,” which asked players to displace, modify, or suppress certain aspects of a city. In a similar, contemporary practice, speculative computing explores the expressive potential of graphical and material permutations in literary documents. Building modernism’s emphasis on subjective experience and spatial transformation into our geospatial methods, we are particularly responsive to Johanna Drucker’s call for expressions of subjective and constructed data, explained as “the difference between putting many kinds of points on a map to show degrees of certainty by shades of color, degrees of crispness, transparency, etc., and creating a map whose basic coordinate grid is constructed as an effect of these ambiguities.” Visualizing geographic ambiguity and uncertainty is thus a chief aim of our maps. We understand the modernist city as mutable and n-dimensional in nature, as a multiplicity of overlapping and interfolding cities, rather than a singular or essential geographic space. This in turn invites investigation into the city at scale. At once alongside and against the practice of Franco Moretti’s distant reading, our maps track trends and currents in modernist geospatial expression that appear through both pattern and instance. And crucially, the subjective experience of modernist narration, as it constructs multiple situated and partial expressions, produces the multiple maps through which our z-axis readings operate. The results are therefore in conversation with projects from the Stanford Literary Lab and the Scholars’ Lab at the University of Virginia. The maps also afford geospatial readings of the novels, themselves. One of our initial findings is that geographic references tend to appear in clusters, or that different areas in the same quarter are often grouped together. In the instance of Nightwood, popular areas in the Latin Quarter are fluid and permeable, whereas wealthy areas near the Champs-Élysées and the Opera are isolated and partitioned from each other. Clusters of references can overlap in cumulative fashion—this is the case for Barnes’s marginal characters who wander vaguely through the Latin Quarter, while also meeting and living in specific areas around Saint-Sulpice. On the other hand, references can appear scattered or contiguous, as is the case for areas where Barnes’s characters meet the wealthy Jenny Petherbridge. Furthermore, the class-based division of Paris becomes entwined with the topic of homosexuality through the carriage ride scene, which begins at Jenny’s house off the Champs-Élysées and ends in the Latin Quarter. Here, the escalating sexual relationship between Jenny and Nora in the carriage ride occurs in concert with the movement from the Champs-Élysées, through the Bois de Boulogne, and finally the fifteenth and sixteenth arrondissements. As the carriage ride moves to more impoverished and residential areas of the city, the geographic references become more vague, referring to the second half of the ride in “the lower parts of town.” Here, vague and imprecise geographical references coincide with Jenny’s sexualized attack on Robin. The situation becomes still more complex when the doctor retells this journey to Nora. In the doctor’s version of the carriage ride, the journey follows the Champs-Élysées to the Pont Neuf, before moving south into the Latin Quarter. After explaining this route, the doctor’s narrative shifts to the trees of the Bois de Boulogne, yet resists providing a specific geographic reference for this location. The doctor displaces the space of the Bois, which he describes elsewhere through markers of class anxiety, such that Jenny’s attack on Nora does not occur in tandem with strong geographic markers of their class distinctions. Rhys’s Paris parallels the spatialized experience of class and gender found in Barnes’s Nightwood. In Quartet, and even more so in Rhys’s later novel Good Morning, Midnight, the descriptions of urban landscapes refuse or certainly make difficult the process of pinning narrative to a single point in the city as seen in Marya’s vague wanderings along the Boulevard Saint Michel or the Boulevard du Montparnasse. A key example of Marya’s construction of the Parisian city can be seen in her presence around but never in the Jardin du Luxembourg. She spends considerable amounts of time in cafés in the area, but her diminishing social and class statuses due to her gender and sexual practices prevent her presence in the classed spaces privileged in the monumental map. In other words, this map shows how Rhys’s narrative privileges spaces traditionally marginalized in social and economic discourse and inscriptively marginalized in popular maps at the time. Patterns also emerge across both novels, as expressed by the warped maps. Both novels demonstrate concentrated bursts of text anchored in places around key landmarks, including the Jardin du Luxembourg and Saint-Sulpice. Furthermore, narrative episodes that take place directly at or in monumental locations tend to document encounters with the upper class. Marya, Nora, Jenny, and Matthew O’Connor exist on the outskirts of the map’s consumerist vision of Paris, mirroring both novels’ traversal of the margins of Parisian society. The clustering of individual, but not overlapping, instances of warping in the Quartet map expresses the obliqueness through which Marya describes her journeys through Paris and the frequency with which she rapidly travels from one place to the next in search of belonging. For Barnes, on the other hand, the clustering of individual instances of warping expresses the isolated nature of encounters with the upper class, whereas the cumulative warping in the Latin Quarter reflects the frequency with which different characters encounter each other there. Both novels understand Parisian space through the lens of class and sexuality, but Rhys constructs a fragmentary and fugitive experience of a marginal Paris, whereas Barnes’s impoverished Paris is social and shared. Ultimately, the maps express not simply trends or patterns in the novels, themselves, but visualize how these novels understand Paris both in part and in whole. While our findings feed digital humanities practice back into modernist literary scholarship, we also see value in extending modernist methods to the realm of digital praxis. We see our strange and surreal maps as an extension of modernist avant-garde experimentation, beginning with the Surrealist and Situationist movements, which employed speculation and experimentation as tools for political critique. We too want to infuse methodological experimentation with political engagement, exploring the ideological biases of existing mapping interfaces. To what extent do top-down and totalizing interfaces, such as seen via Google Earth, favor normative conceptions of space or make difficult the expression of marginalized narratives? Echoing Alan Liu, we believe that digital humanists are uniquely positioned to query the political nature of tools and interfaces, and to design new solutions that advance our cultural engagements with technology. By bringing culture to bear on method, by exposing the political in the interface, we see methodological experimentation as a process through which practitioners can craft meaningful interventions in the technologies we use. Barnes, Djuna. Nightwood: The Original Version and Related Drafts. Ed. Plumb, Cheryl J. Normal, IL: Dalkey Archive Press, 1995. Print. Best, Stephen and Sharon Marcus. “Surface Reading: An Introduction.” Representations. 108.1 (2009): 1-21. Print. Drucker, Johanna and Bethany Nowviskie. “Speculative Computing: Aesthetic Provocation in Humanities Computing.” A Companion to Digital Humanities. ed. Susan Schreibman, Ray Siemens, John Unsworth. Oxford: Blackwell, 2004. Web. Hegglund, Jon. “Ulysses and the Rhetoric of Cartography.” Twentieth Century Literature. 49.2: 2003. 164-192. Print. Ramsay, Stephen and Geoffrey Rockwell. “Developing Things: Notes toward an Epistemology of Building in the Digital Humanities.” Debates in the Digital Humanities. Ed. Matthew K. Gold. Minneapolis: University of Minnesota Press. 2012. 75-84. Print. Rhys, Jean. Good Morning, Midnight. New York: Harper & Row. 1970. First published in 1939. Print. —. Quartet. London: Andre Deutsch. 1969. First published in 1928. Print. Vidler, Anthony. Warped Space. Cambridge, Mass: MIT Press, 2000. Print. Post by Alex Christie, Stephen Ross, Jentery Sayers, and Katie Tanigawa, attached to the ModVers category, with the versioning tag. Cross-posted at mvp.uvic.ca. Images for this post care of Alex Christie and Katie Tanigawa.